Full Permission Nutrition – Page 3 – It's Time to Find Food Freedom and Enjoy Life's Pleasures! Switching up my salads weekly is like a game to me. 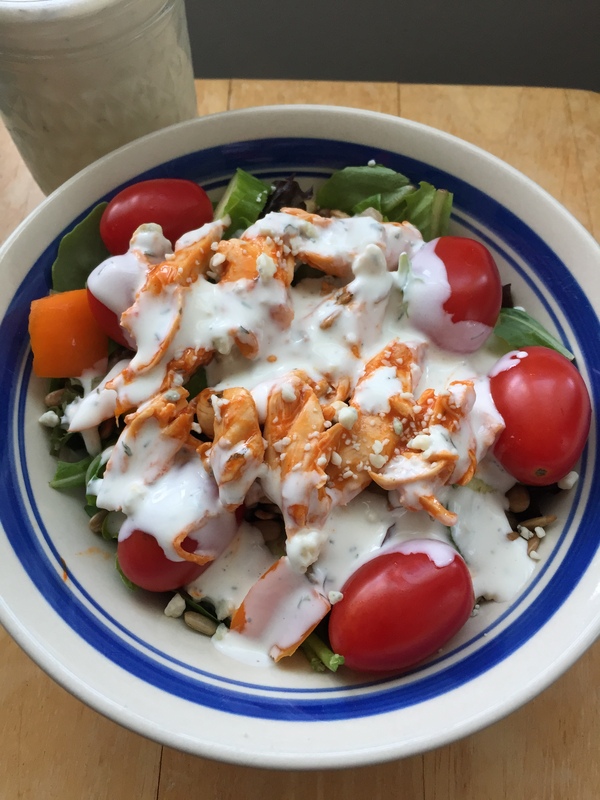 How can I combine my favorite toppings in different ways to make a delicious salad that I don’t mind eating all week? Usually I try to base them off salads I’ve had in a restaurant or seen on Pinterest. 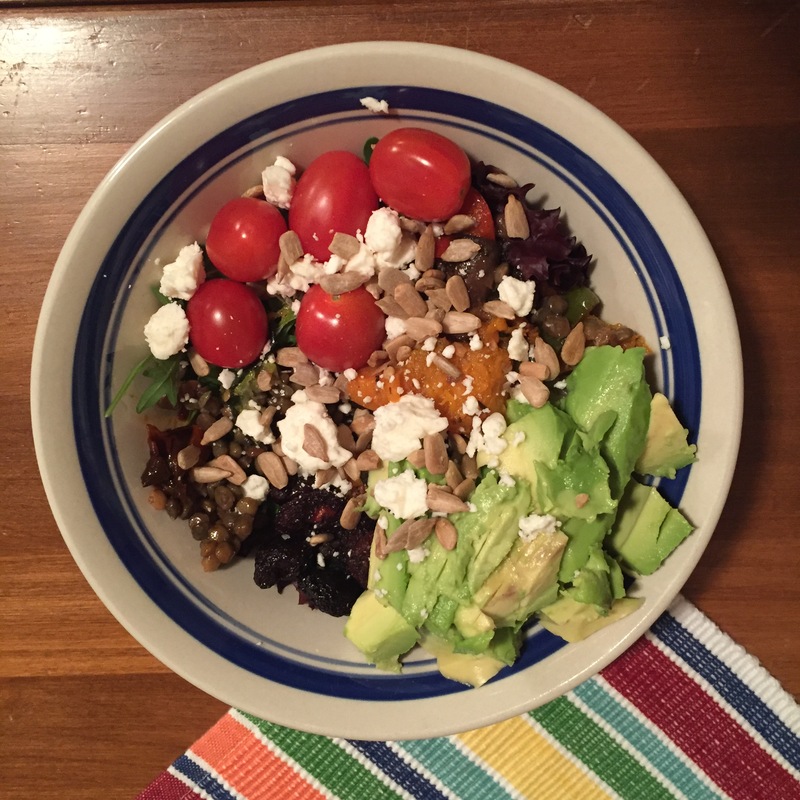 Last week was a Pinterest copy-cat recipe – a Mediterranean salad bowl. 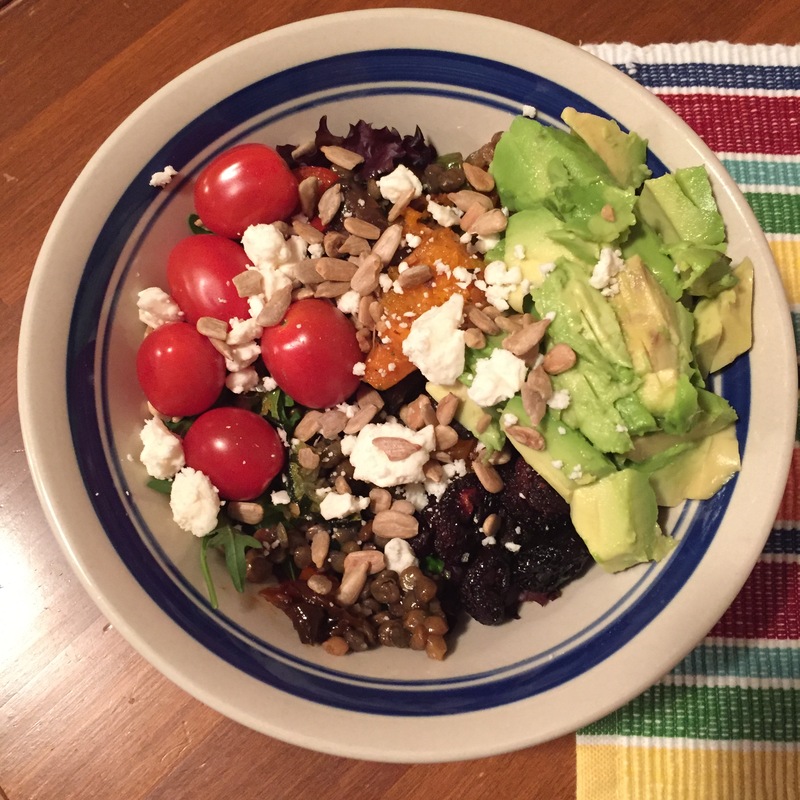 I added all my favorite “Mediterranean” toppings (as well as avocado…I just can’t have a salad without it…) on a big pile of greens and it was delicious! Since I topped with hummus, I don’t think it really needed dressing, but I tried to make one anyways. I used tahini, lemon juice, olive oil, a little milk, and some sriracha. Kind of random, I know. 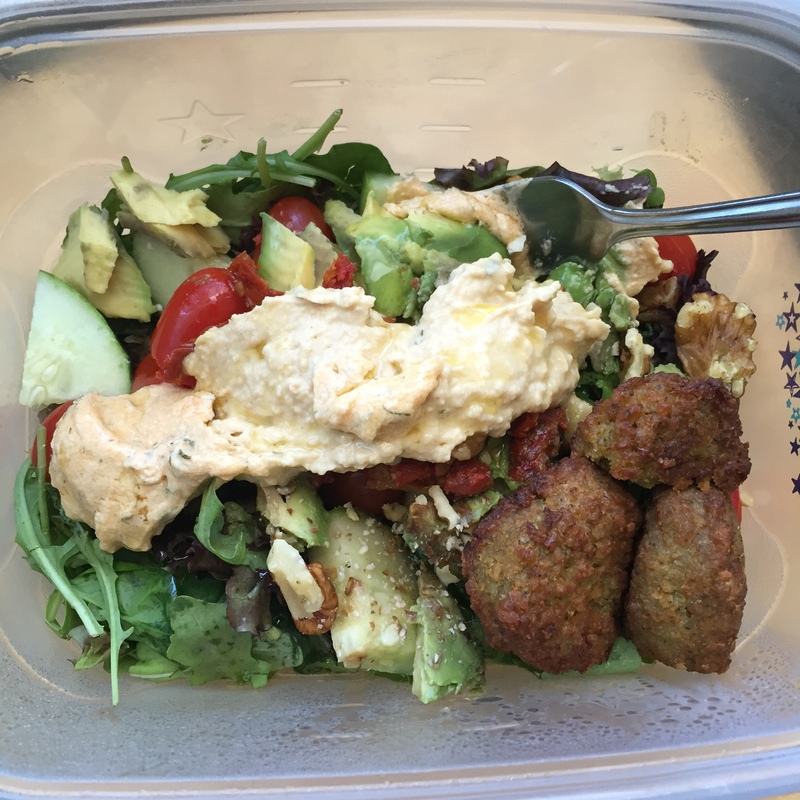 It was ok but not fantastic – so Mediterranean dressing ideas are welcome! 1.) 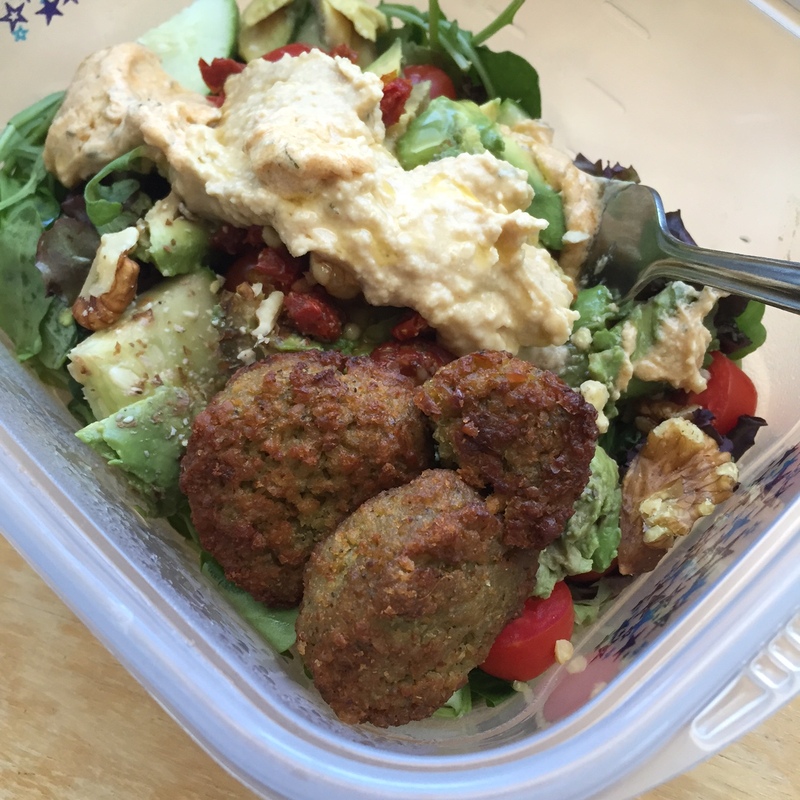 Preheat oven and bake falafel (frozen or homemade). 2.) In a big bowl, add spring mix. Top with the rest of the toppings and the warm falafel. Enjoy! Anyone who knows me sees that I eat avocado pretty much every day (it might be an addiction). I also looooove bacon and goat cheese, which luckily doesn’t hurt my stomach at all. 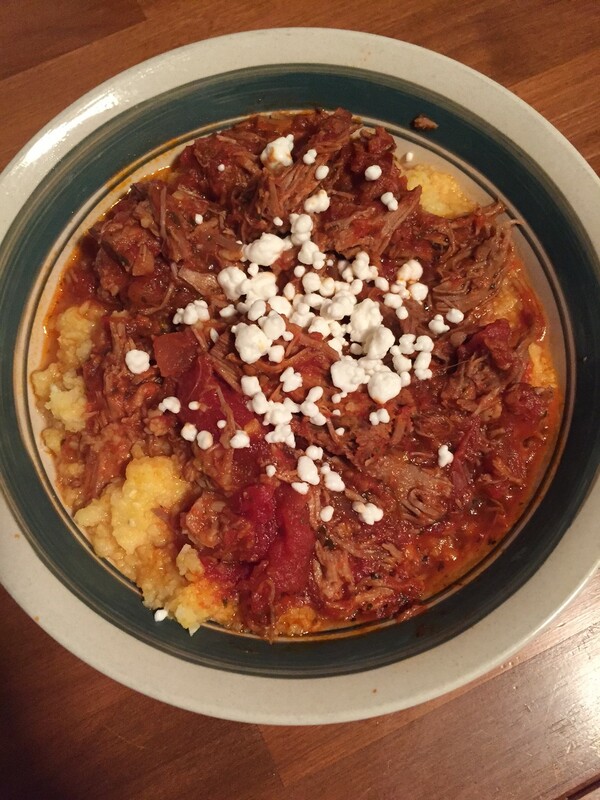 So this recipe was right up my alley! 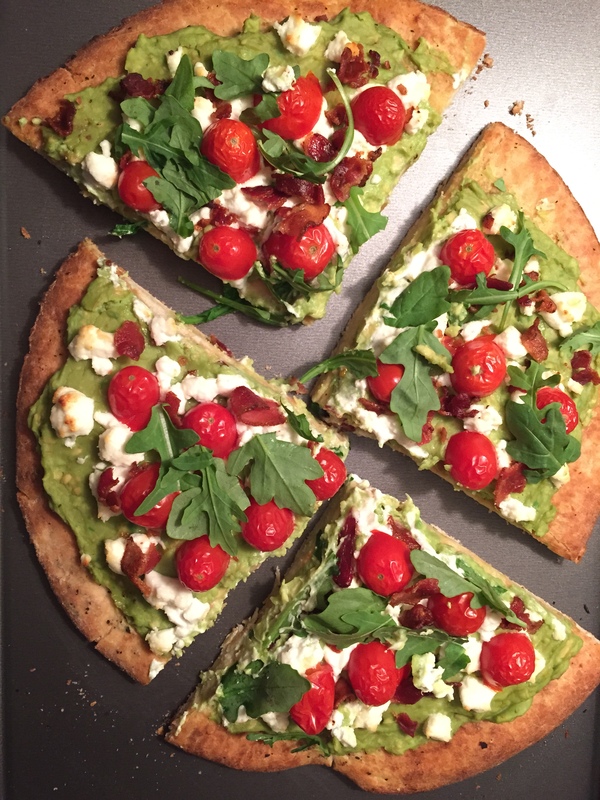 You might be thinking “Avocado instead of pizza sauce? What? ?” but I promise it’s just as glorious as it sounds. And so easy to make! 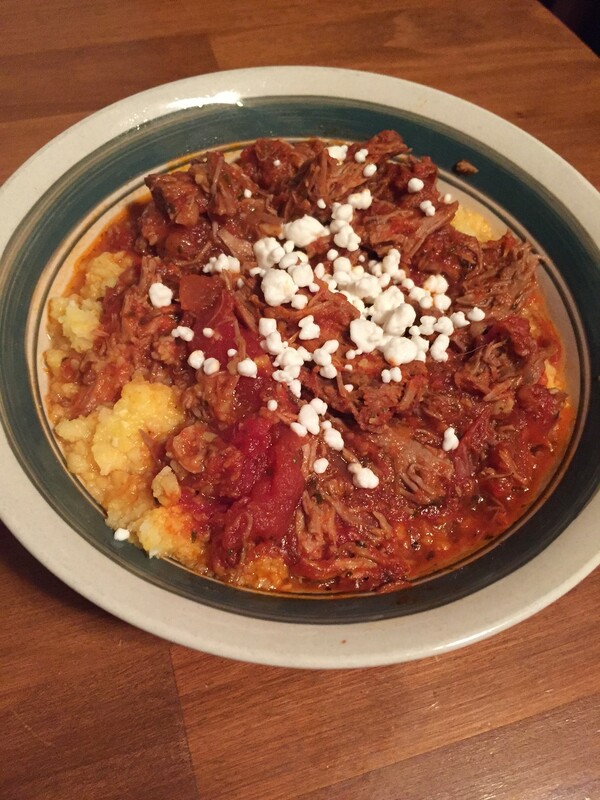 This is a great recipe to whip up on a Friday night when you don’t want to cook. Just keep some pizza crusts in the freezer and you can have this pizza ready in less time than delivery! 1.) Bake pizza crust according to instructions. 2.) Mash avocado in a small bowl with garlic, red pepper, and salt and pepper. Spread on baked pizza crust. Top with halved cherry tomatoes, bacon crumbles, and goat cheese. Bake for another 5-10 minutes or until cheese begins to melt. 3.) Top with arugula, cut into fours and enjoy! I LOVE buffalo sauce. I find it funny that I used to hate anything spicy, and now I’m buying jars of jalapenos and Frank’s Hot Buffalo Sauce like it’s going out of style. Oh how things change! I also love my salads, so I figured why not combine my two loves into one? 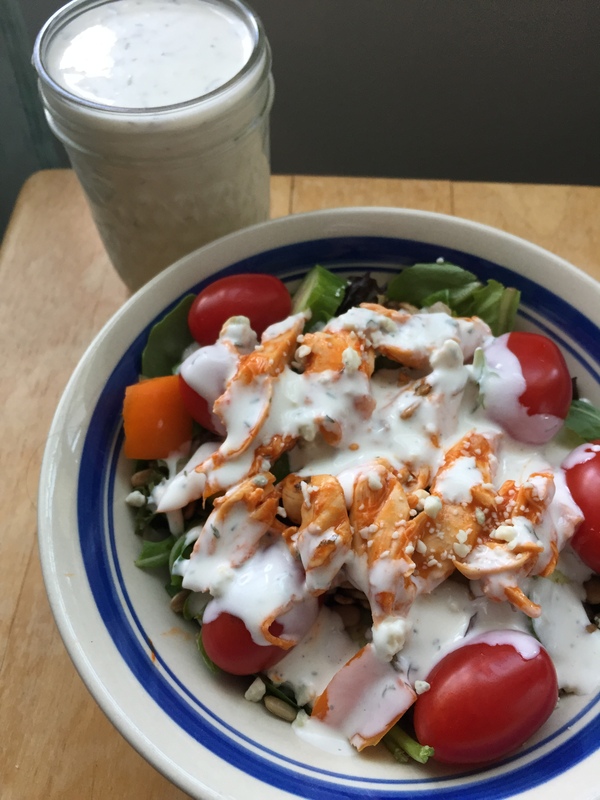 I prefer making homemade ranch dressing because it’s much healthier, I know all the ingredients, and I can make it lactose-intolerant friendly. Store-bought ranch (even the ranch seasoning packets) almost always have buttermilk as an ingredient, so I have to stay away from that. 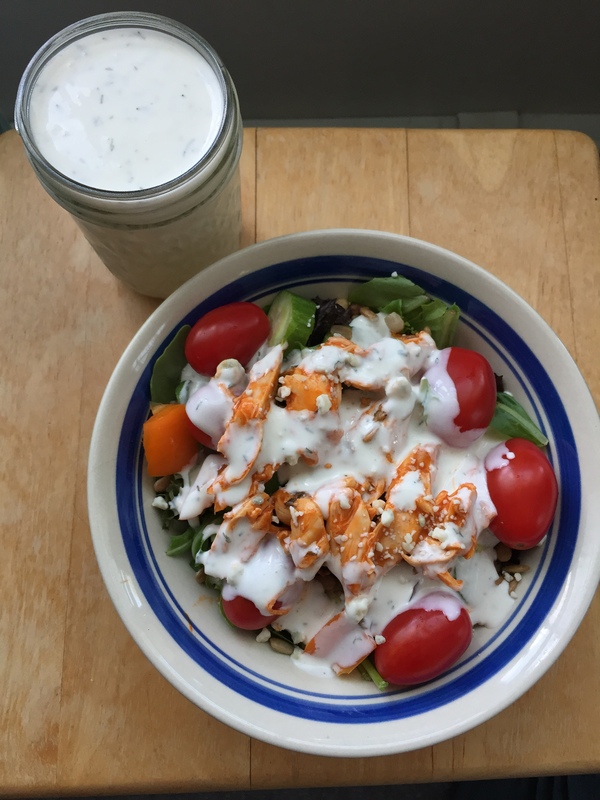 Not everyone with lactose intolerance can handle yogurt, but it doesn’t give my stomach any issues, so I used yogurt as the base for this dressing. It’s so yummy and tastes even better once it sits in the fridge overnight! This is one of those “I am claiming this is a recipe but it’s really a handful of things thrown together to suit my tastes” type of recipes. Which means you can adapt it to match your tastes too – like it less spicy? Use mild buffalo. Want to make more chicken? Just up the amount of sauce when baking. Like your dressing thicker? Use more yogurt. Go wild! 1.) Spray a 9 x 13 glass baking dish with cooking spray. Lay out tenderloins and smother in buffalo sauce. Bake for about 20 minutes or until center is no longer pink. Let cool and shred chicken. 2.) 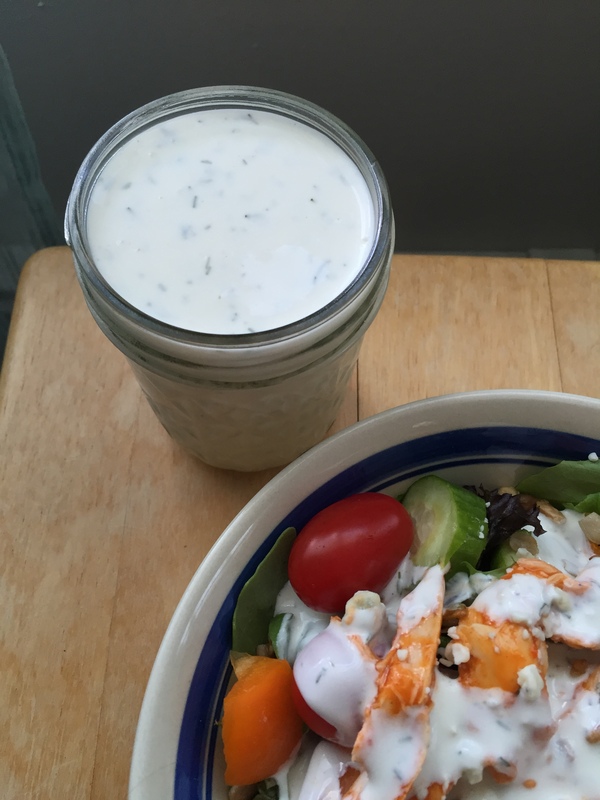 To make the dressing, combine the yogurt, mayo, milk, dill, garlic, mustard, and salt and pepper in a bowl. Whisk together. Feel free to add more of any ingredient as necessary, adding more milk to thin it or more yogurt/mayo to thicken. Put in a jar or container in the fridge; it will last about a week! 3.) In a large bowl, make your salad! Top salad mix with a handful of tomatoes, diced pepper and cucumber, and 1 tbsp each of sunflower seeds and blue cheese crumbles. Top with 1/4 cup of shredded chicken and the amount of dressing you would like. Enjoy! As I have mentioned before, beef stroganoff is my favorite meal, yet now that I am lactose intolerant I’m aiming to be dairy-free at home. But when I found a dairy-free recipe for stroganoff, I was more than skeptical. How can it be stroganoff without the sour creamy sauce?! A dairy-free version would certainly be sub par. Maybe even inedible. The secret creamy ingredient in this recipe is coconut milk. Insert more skepticism here. 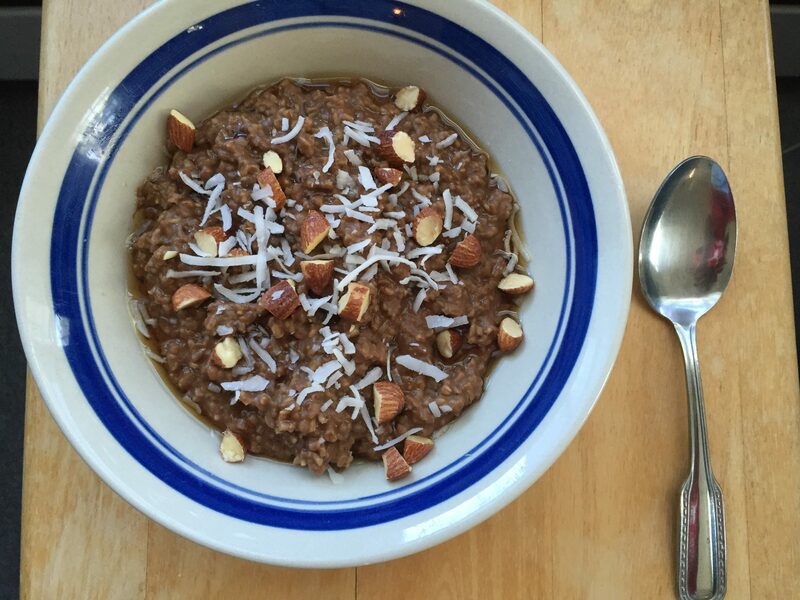 I LOVE coconut, but in stroganoff? Yet since the recipe got great reviews, I decided to trust the recipe creator’s promise that the other flavors would mask any coconut taste. 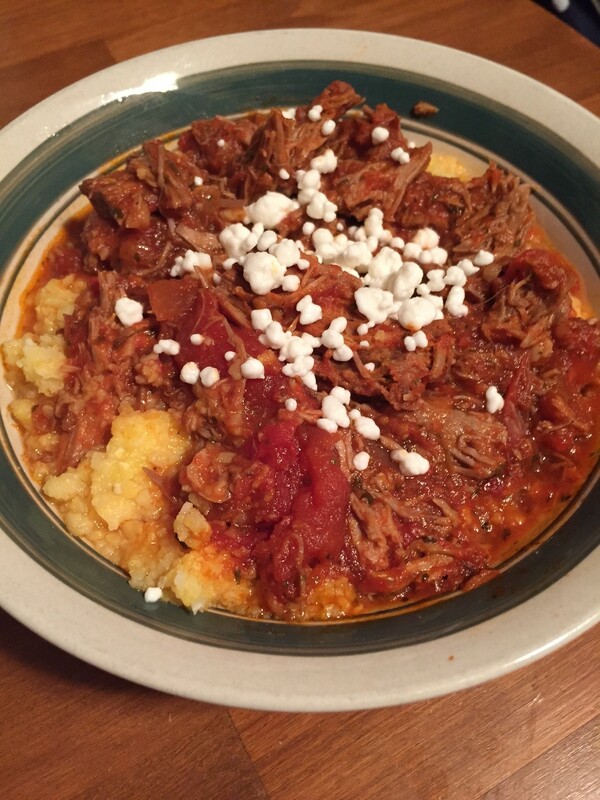 I also really wanted to try a crock pot version of this meal, since that makes my life wayyyy easier. And let me tell you, it was SO GOOD. I went in with about as much skepticism as possible and came out praising Amy at Wholesomelicious for creating this seemingly-unlikely-to-impress-my-stroganoff-taste-buds recipe. I want to find her and give her a hug. Oh, and I also may have licked the bowl clean. It was that good. Coming from a beef stroganoff connoisseur, that means it is awesome – trust me! 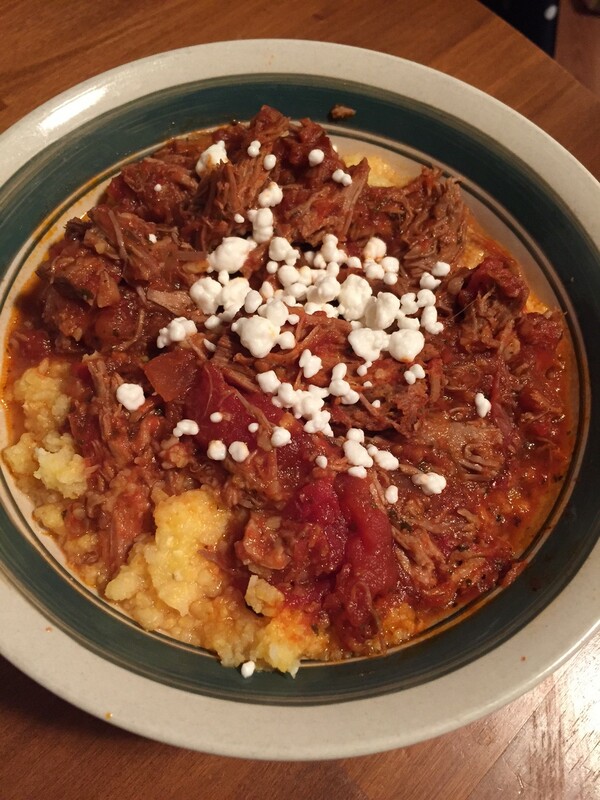 I actually ended up adding more coconut milk to the crock pot after taking these pictures (and eating the first bowl). I found the taste to be even better after that, making me even more excited to eat the leftovers. I also found that it looked the exact same color as my sour cream version, which made me happier. But depending how creamy you like the sauce, you can experiment to your taste. You can also add more/less beef, mushrooms, add in other veggies…I will definitely be trying some other variations! It made 5 servings for me, because I like a lot of sauce, but you could definitely get 6 servings out of this recipe. 1.) Add beef to 6 quart crock pot and top with onions, garlic, and mushrooms. Pour broth, soy sauce, and vinegar over the beef and veggies. Add garlic and onion powders and stir. Cook on low for at least 5 hours. 2.) At the last 30-60 minutes of cooking, add the coconut milk (shake well before adding) and the cornstarch. Stir in and continue cooking on low for 30-60 minutes, until sauce is thickened. 3.) Serve over egg noodles or another pasta, rice, veggies, etc.